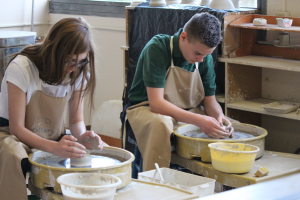 St. Pat’s has two potter’s wheels and art students learn their use along with many hand-building techniques. Pre-k and kindergarten students are introduced to the potter’s wheel. With teacher or student help, they get to squeeze and stretch the spinning clay. First through fifth graders have individual turns on the wheel with parent or teacher guidance. Glazed potter’s wheel projects usually come home in the spring. Sixth grade students have individual turns with teacher as helper. Students in the seventh and eighth grades have multiple individual turns working on their own or with help as needed.